Pieces of glass are one of the essential parts of creating personalized do it yourself glass etching creations. You can use any piece of glass you want. For instance, you can etch on mirrors, glass in doors, windows, wine glasses, martini glasses, and so on. You will also need either masking, vinyl, or painter's tape; a measuring tape; a paint brush, a craft stick or popsicle stick; etching cream; any desired stencils; adhesive for the stencils; a craft knife or Xacto knife; and a source for water. First, you need to make sure that the piece of glass that you are working with is completely clean. Etching works best on glass that has been cleaned thoroughly with no lint of dirt left behind. After a thorough cleaning, allow the piece of glass to air dry. When the glass is completely dry, if you are using a stencil to etch, apply the stencil. Several different types of stencils can be used. For example, stencils can be purchased that are self adhesive. For self adhesive stencils, locate the spot where you want the stencil to appear on the glass, remove the backing and place the stencil. For stencils that are not self adhesive, use the adhesive tape to attach the stencil to the glass in the desired spot. Make sure the tape is attached securely so the stencil fits tightly against the glass to avoid etching cream going under the stencil and etching the wrong area of the glass. Once the stencil is applied to the glass, go over it with your craft stick to flatten out any air bubbles, wrinkles, or other blemishes that may appear while taping it down. First, make sure that the etching cream does not leak under the stencil by avoiding allowing the cream to accumulate near the edges of the stencils. Second, make sure the application is a thick and even coat. Once you have applied the etching cream, allow it time to dry. Every type of etching cream is different, so follow the instructions on the cream you purchased. After the recommended time has passed and the cream is dry, it is time to remove your stencil from the glass. Remove the stencil in its entirety, making sure to remove all tape as well. Once you have removed everything, you may notice some adhesive on the glass and some remains of the etching cream. Wash the glass in warm soapy water until all unwanted residue is off. Allow the glass to dry and your project is complete. Don't worry if the design appears barely noticeable on the glass at first. The etching cream will continue to darken, allowing the stencil design to show more in a few hours or so. Once you have set your piece aside to dry, take the time to clean off your stencils. Stencils are made for repeated use. Clean them off immediately after the etching and removal process is completed by scrubbing them lightly with soapy warm water or placing them in the dishwasher. Etching can be done inversely as well. 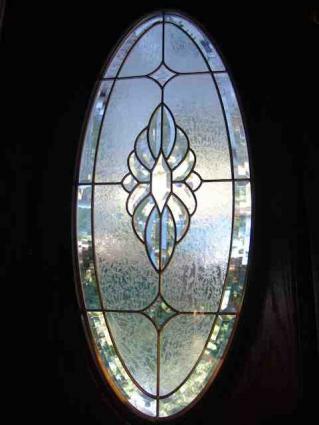 For instance, instead of having a clear glass with etched designs, you can also create a glass with a frosted appearance that has clear glass designs amongst the frost. To do this, simply apply solid shapes using self adhesive stencils or adhesive tape to attach solid stencils. Then, dip the entire piece into etching liquid so the glass is covered entirely from top to bottom. Allow the piece to dry according to the recommended drying time for your brand of etching cream. Remove the solid stencils from the glass and you will have achieved the opposite affect: a frosted piece of glass with stenciling done in clear glass.